The exploitation of the meadows that stretch beyond the woodland has distinguished the rural economy in the alpine valleys for centuries. Alpine pasturage represented the final phase of a process that began in spring, when the meadows beyond the town border were used, and ended in summer, with grazing at a high altitude. 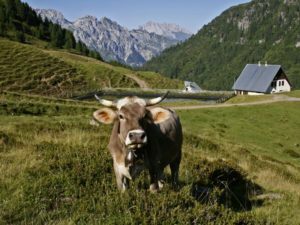 Nowadays, alpine pasturage has become a characteristic element to produce a typical top quality foodstuff which is available on a rigorously seasonal basis: malga cheese. But what is a “malga”? The “malga” can be considered a kind of productive micro-universe, consisting of a wide stretch of land devoted to cattle grazing which has a few buildings on it: the stables, to shelter animals and the “casera”, where the personnel is accommodated and where the raw material, milk, is processed into its end products, cheese, ricotta and butter. In the past, the “malga” was run by a “malgaro” (malga shepherd), who put both his animals and those belonging to other minor livestock breeders to pasture. The rest of the personnel included the “casaro” who was responsible for the processing of the milk and the management of the kitchen and the shepherds who looked after the animals and cleaned the staff accommodation and the stables. Today, after a period of semi-abandonment, many “malga” have been renovated and re-opened: in some cases, the historical organisational model has been maintained, in others the malga functions have been extended to involve tourism-related activities including the sale of products on-site and tourist accommodation. By means of a road network linking the valley bottom and the high-altitude pastures, it is possible to easily reach the local “malga” and the “casera” during a trip or to spend a holiday and in this way, to discover, an aspect of the ancient culture and traditions of the alpine area.